All 16 of the company's new guitars boast Sustainer, Fishman Fluence and multi-scale options. 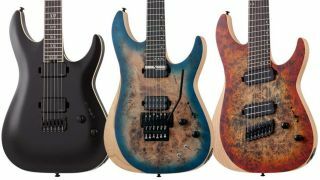 Sixx:A.M.’s Dj Ashba has teamed up with Schecter Guitar Research and Dean Markley USA to launch two new products. Schecter Guitar Research has just uploaded this video showing the creation of a Michael Anthony Rat Rod bass by assembly technician Jake Ball and Custom Shop manager Shigeki Aoshima. The gang at Schecter Guitars have shared the latest edition of "Conquering Rifftopia," a webisode series starring Jeff Loomis of Conquering Dystopia. Schecter Guitars has signed on as this year's official Aftershock guitar sponsors. Avenged Sevenfold guitarist Synyster Gates has teamed up with Guitar Center, Schecter Guitars and Ernie Ball for the "Ultimate Master Class Fly Away with Synyster Gates."